This article describes all the items you'll need to learn the calligraphy hand that you've chosen. You will also need a board to write on. A drawing board which can be adjusted to different angles is great, but certainly not essential. A piece of wood or MDF will do the job well - ideally it should be at least A2 size (60cm x 42cm) but something smaller will be just fine for now. If you don't have a board yet, of course you can start by writing on a flat surface - e.g. the kitchen table - I'd just strongly recommend you consider using a board. See "Preparing your writing board" for more information. The specialist calligraphy items are PEN and INK. A dip pen (a holder with separate nibs) is a great tool to learn to use. 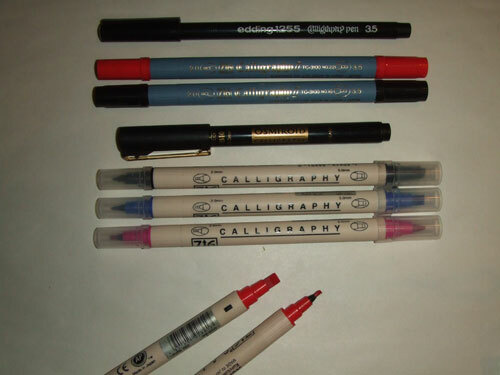 It will bring challenges, but it is the tool of choice of most calligraphers, and gives you the best lines and the most options for writing fluids. If you are purchasing, I'd recommend buying Roundhand nibs. 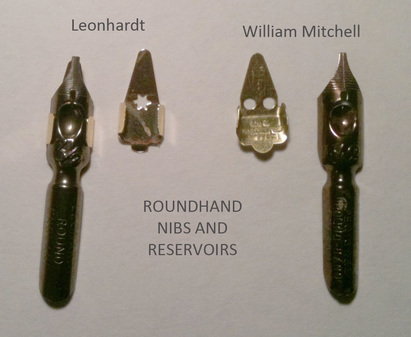 There are 2 manufacturers : William Mitchell and Leonardt - and the sizes of nibs from the 2 manufacturers are (more or less!) the same. For now I'd recommend you buy a number 1, 2 and 4 plus one or more holders, plus one or more reservoirs. 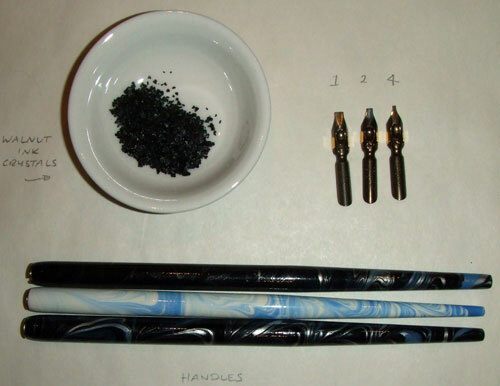 An alternative to a dip pen is a Pilot Parallel pen (cartridge pen). These are delightful to use, and work on most papers (but the ink bleeds on some) - they're easier to use in the beginning, but won't give you the control or flexibility you'll get from a dip pen. Fibre tip (felt tip) calligraphy pens are great for playing and for getting started (especially Zig pens), but will not have the sharpness need to evaluate your letters. An alternative which I use very regularly for practice is walnut ink. You make it yourself by mixing Van Dyck crystals (made from walnut husks) with water, to get a lovely brown ink. I predict you'll have questions I've not answered - so please ask away! Places to shop - Some art shops stock calligraphy equipment, but a warning would be that just because it has the word "Calligraphy" on it, doesn't make it a good item for calligraphy - which is a pain! - these are perhaps harder to shop at without having tried items, although I'll share tips on great products as I think of them! For "real" shopping, some good art shops stock calligraphy items - there seems to be little consistency on what is stocked. A wonderful shop - worth a visit simply for the "step back in time" feel - is Cornellisens in London. It's on Great Russell Street, just a couple of minutes stroll from Tottenham Court Road.